Aspinal of London's collection of Leather Notepads and Folios are the perfect note-taking companion for business executives and students alike. Available in both A4 and A5 to suit your needs, our refillable pads sit within a suede-lined interior, adding an essence of luxury to the presentation of your work. Each portfolio is handmade in our workshops from superior leather and finished with an eye for detail, including business card slots and a pen loop. For all the talented artists designers and photographers Aspinal have created a range of beautiful exclusive handmade art portfolios perfect for the photographer, graphic design , architecture drawings, fashion photography and presentation of all artworks painting, sketches and business presentations. Aspinal's stunning leather portfolios simply ooze style, quality and elegance! Each leather portfolio is handmade in our workshops using the finest leather, solid brass Swiss made zips and lined in Aspinal's signature contrasting soft-suede and moire silk. Portfolios are a critical part of presenting your art works in the business and creative arena. For people in the creative industries, art portfolios are a necessity for transporting and presenting artwork, photography and other design work. 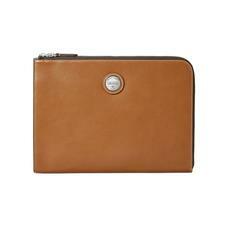 For executives, leather portfolios and personalised portfolios for writing convey professionalism. For marketers and tradeshow exhibitors, personalised portfolios can be used as giveaways or prizes. Art portfolios protect your creative works - from getting bent, scratched, faded or otherwise damaged. Presentation portfolios allow you to show off your past projects, artwork, photography or other design work. Leather portfolios and padfolios let you keep all your notes, neatly in one place and support your business needs at meetings and research. Personalised portfolios add that extra touch and make a lasting impression to clients, customers or top achievers on your staff.